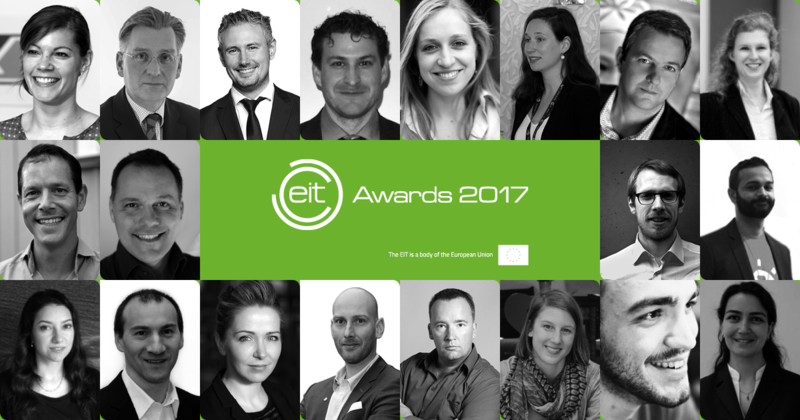 Learn all about the nominees for the EIT Awards 2017! Read about all of the 2017 EIT Awards nominees in our exciting exciting and informative new flip book! The EIT recognises the exceptional achievements of members of its innovation communities through three categories in the annual EIT Awards, celebrating achievements and successes, identifying role models to strengthen Europe’s entrepreneurial culture and increasing opportunities for the development of EIT Award winners. The EIT CHANGE Award celebrates graduates of EIT-labelled education programmes who spur innovation and entrepreneurship and bring about a change in the areas of climate change, digitalisation, energy, health, food and raw materials addressed by the EIT and its innovation communities. Prize money is EUR 15 000 for the winner. The EIT Innovators Award recognises innovation teams composed of individuals from our innovation communities that have developed a product, service or process with a high potential for societal and economic impact. Prize money is EUR 50 000 for the winner. The EIT Venture Award puts the spotlight on successful entrepreneurial start-ups that have been supported by the innovation communities through dedicated business creation or business development processes. In addition to prize money, what to EIT Awards winners receive? Time to pitch and present during INNOVEIT 2017 (Budapest, 15-17 October) - all for a chance to win … the EIT Awards! Who can apply for the EIT Awards? The competition is restricted to members of the EIT Community, as indicated above. Keep up-to-date with the latest news from the EIT Community.